Set up your Philips Smart TV and install the apps you'd like to use (e.g., Netflix, Hulu+, Plex). Once connected, you may use Harmony to control your Philips Smart TV and trigger Activities in which your Smart TV is included. Launch the Harmony mobile app and connect to your Harmony hub. Select MENU, then Harmony Setup > Add/Edit Devices & Activities > DEVICES. Select the ADD DEVICE button at the bottom of the screen. 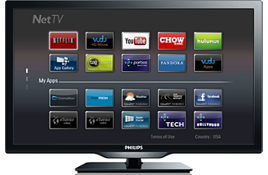 Select ENTERTAINMENT DEVICE and enter manufacturer Philips followed by your Smart TV model number. Once added, Harmony will prompt you to create an Activity. Select Yes. Continue through the series of questions to build your Watch Smart TV Activity. Launch the MyHarmony desktop software and sign into your account. Select your Harmony product from the Remote Gallery screen. Select the Devices tab on the left side of the screen. Select the Scan for devices button near the center of the page. You will be prompted to connect your Harmony to your computer with the provided USB cable. Harmony will scan your home Wi‑Fi network for devices. Ensure both your Philips Smart TV and Harmony Hub are on the same Wi‑Fi network. Select the Add device button. Enter the manufacturer Philips and enter your model number. Below are some tips on using Harmony with your Philips Smart TV. Once you've added your TV to Harmony and setup is complete, we recommend setting up a Smart TV Activity. Control icon lists commonly used Philips Smart TV buttons. Gestures allows you to control your Activity using simple swipe gestures over your phone screen. For example, swiping up/down will change your volume. Favorites will display all your Philips Smart TV channels for easy switching. 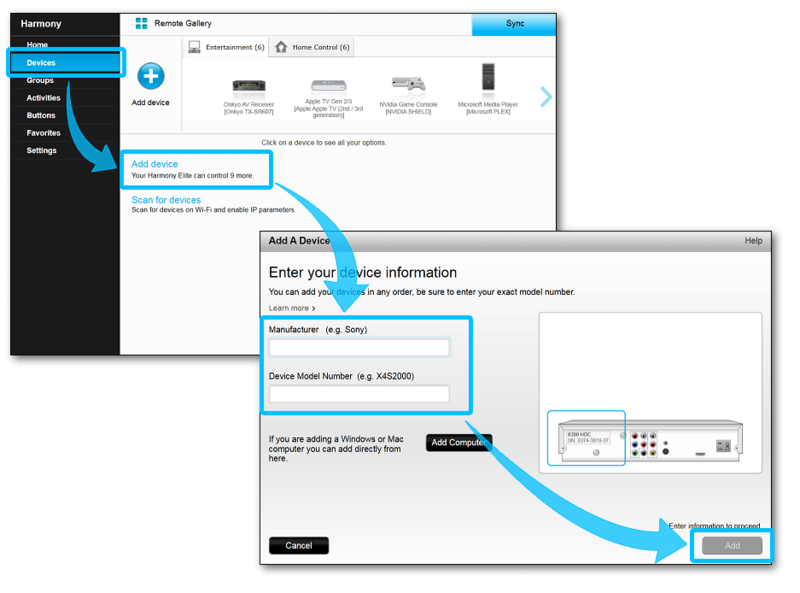 Voiceand Text entry allows you to control your Philips Smart TV using your mobile device's keyboard and/or microphone. Direction Pad Navigation will navigate the Netflix app. Media Keys such as Play, Pause, Stop, FastForward and Rewind commands work. Netflix allows you to move a frame forward or backward using the direction left and right arrows. Text entry is possible using the Harmony app. Direction Pad Navigation will navigate the Hulu app. Media Keys such as Play, Pause, Stop, FastForward and Rewind commands work. The Hulu app has an on screen keyboard you navigate using direction keys and does not accept keyboard text entry. Direction Pad Navigation will navigate the YouTube app. Media Keys such as Play, Pause, Stop, FastForward and Rewind commands work. YouTube allows you to navigate between videos using the Skip Forward and Skip Backwards commands. The YouTube app has an on screen keyboard you navigate using direction keys and does not accept keyboard text entry. Direction Pad Navigation will navigate the Amazon app. Media Keys such as Play, Pause, Stop, FastForward and Rewind commands work. Amazon allows you to move a frame forward or backward using the direction left and right arrows. Direction Pad Navigation will navigate the Plex app. Media Keys such as Play, Pause, Stop, FastForward and Rewind commands work. Plex allows you to move a frame forward or backward using the direction left and right arrows. Direction Pad Navigation will navigate the Browser app. Media Keys are not used within the Browser app. Text entry is possible using Harmony Smart Keyboard or Harmony app. Mouse/Cursor control is possible using Harmony Smart Keyboard. The behavior of other apps may vary depending on its design. Some apps may require the use of the original Philips Smart TV remote. These are typically apps that make use of motion control. Harmony has already optimized the buttons on your remote; however you can further customize these buttons depending on your preference. 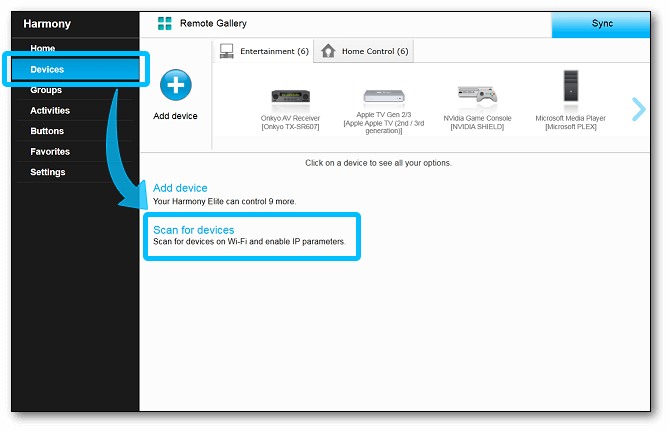 Harmony automatically imports your Philips Smart TV channels and displays them under the favorites section on your Harmony remote. Commands specific to your Watch Smart TV Activity are also displayed for which you can add, remove or rename them. You can view common Philips Smart TV commands on your phone or tablet screen. You can add, remove or rearrange these commands. By default, swiping up or down on the gestures screen will change volume. There are 22 gestures in total, view and customize them from the app. Launch the Harmony Express app and tap Edit Setup. Next, tap + to perform a Wi‑Fi scan, and select your device. If your device isn't found, ensure it's on the same Wi-Fi network as Harmony Express. If you still have issues, reboot your device and router then try again. Tap Continue and follow the on-screen prompts. You can use your voice to send commands such as turn on, turn off, and more. Tap What to say in the Harmony Express app to see sample commands for your device. Launching apps using your voice is not supported for this device. Media Keys such as Play, Pause, Stop, FastForward and Rewind commands work. Hulu allows you to skip 10 seconds forward or back using the direction left and right arrows. Media Keys such as Play, Pause, Stop, FastForward and Rewind commands work. YouTube allows you to navigate between videos using the Direction Right and Left commands. The behavior of other apps may vary depending on the app's design. Harmony connects to and controls your Philips Smart TV using IR (infrared) signals. Some Smart TV models may offer text entry via Bluetooth when using a Harmony hub‑based product. In this case, your mobile device must be connected to the same Wi‑Fi network as your Harmony hub. Philips Smart TVs are compatible with all IR (infrared) based products. Philips Smart TVs may be controlled using infrared (IR) signals that are sent directly from your Harmony remote as well as using your voice after pressing the OK button.